Jessica Johnson and Christina Berriman Dawson in Key Change. Photo by Keith Pattinson. BOTTOM LINE: A short and dense theatrical spectacle that delivers bitter truths with poetic justice and surgically precise acting. One step past the box office and a replica of a prison pad or room. Hardly enough space to move, let alone to exist. Behind it, black walls covered in statements written in white chalk by incarcerated men for whom the play was performed back in 2014. Talk about a powerful prologue to the evening. Thinking the play would take place there, my mind grew curious. Minutes later, after having had the time to take the atmosphere in, we were directed to the room where the play would actually happen. There, a naked stage, nothing but a few chairs, a small desk and some controls. The space, although void of elaborate sets, was already filled with the voices read minutes before. 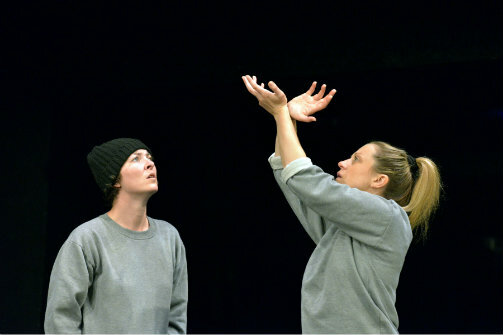 Key Change, a play devised with women in Her Majesty's Prison and written by the brilliantly dry and sharp Catrina McHugh, shines a light on the situation of women in prison, their befores and afters. Focusing all voices in the characters of Kelly (Christina Berriman Dawson), Lucy (Cheryl Dixon), Kim (Judi Earl), Angie (Jessica Johnson) and Lorraine (Victoria Copeland), it also paints the story darker with other small apparitions from the men and officers involved in the incarcerated women's lives—characters played by the above mentioned actors with surgical precision, and humanity. The five women each represent a type—all depicted with intelligence and heart—delivering the stories without gratuitous sentimentality and commendable strength. While Copeland acts as both the quiet and observant Lorraine and the deputy stage manager—one of the many clever resolves director Laura Lindow presents us with—Johnson's portrayal of Angie is both breathtaking and heartbreaking. Dawson is an actor of immense talent and her portrayal of both Kelly and Lucy's abusive boyfriend is astounding in its nuances. Dixon finds a delicate balance in portraying first-time offender Lucy, giving us a sweet push-over who ends up finding her inner strength no matter how thin it may appear. Earl's rendition of Kim, the oldest offender of the group, is delicious as she balances the grandma appeal with the tough skin of her character. These powerful performers understand the value of detailed, fearless acting, and are able to unlock the pain and suffering contained behind bars, under the scars, and on the battered skin of the women whose voice are being echoed on stage. If it's the carefully woven fabric of voices and stories that makes this a punch-strong show or if it is the fact that it is delivered carefully through equally powerful moments of comedy, completely earned lyricism and precise timing—applause here again to Lindow—that makes Key Change a much needed piece of theatre, it doesn't really matter. What matters is that this exists and has crossed the ocean to play in New York City. What the show lacks in production values, it makes up for in acting skills and in heart. Kept alive by these fantastic five, the heart has its temperature manipulated by the precise work of lighting designer Ziggy Jacobs-Wyburn. McHugh's beautifully crafted words enrich the discussion of gender inequality, abuse towards women and the inefficacy of the prison system in correcting criminal offenders. I was left wondering several things, but the most persistent question was: how are lives that were broken from the very beginning expected to mend if they don't know any better? In bringing characters and lives that are locked up, Key Change liberates a taboo and takes us towards a much needed change, modulating abuse into empowerment. A must-see play. Key Change is devised with women in Her Majesty's Prison and written by Catrina McHugh and directed by Laura Lindow. Lighting design is by Ziggy Jacobs-Wyburn. Composition and sound design is by Roma Yagnik. 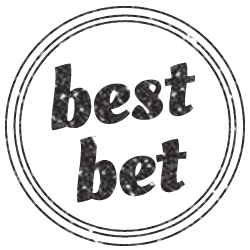 Jill Heslop is the creative producer. Kate McCheyne is the stage manager. Victoria Copeland is the deputy stage manager. Original choreography is by Holly Irving and movement support is by Kolly 'KijJala' Rose. The cast includes Victoria Copeland, Christina Berriman Dawson, Cheryl Dixon, Judi Earl and Jessica Johnson.